Would you let your child play football? That’s a hot question these days as information about long-term medical problems among former players in the National Football League (NFL) continues to be revealed. The NFL recently settled a lawsuit for $765 million involving thousands of its former players. The players claim that the league knew of the potential risk of brain damage due to repetitive concussions, but did little to educate them or prevent the injuries from occurring. Some former players link their current medical conditions such as Parkinson’s, Alzheimer’s, Amyotrophic Lateral Sclerosis (ALS), Chronic Traumatic Encephalopathy (CTE), and other neurodegenerative diseases to their football playing days. A recent study suggests that professional football players are three times more likely to have such conditions than the general population. The study, which was published September 5, 2012 in the medical journal Neurology, surveyed nearly 3,500 retired NFL players who were in the league between 1959 and 1988. The NFL has taken major steps in recent years to make the game safer for its players, both in terms of equipment and protocol. In the past, though, whenever a player got his “bell rung” and wobbled to the sideline, he was sent right back into the game as soon as possible, exposing the player to further head injuries. Is The Danger Focused On The Bigger, Tougher NFL? Obviously, there’s a big difference between Pop Warner and the NFL. The massive size, speed and power of players competing at the highest level is in no way comparable to young kids just picking up the sport in elementary school. You won’t see the kind of violent collisions in Pee Wee games that you do on Monday Night Football. On the other hand, there’s also a big difference in the quality of protective equipment used by pros versus youngsters. And, whereas qualified medical staff is always on the sidelines at practices and games for college and pro teams, that’s not the case for younger players. The barrage of recent media coverage regarding the NFL lawsuit is shining a light on the dangers of the sport and making parents across the country wonder whether the risks are worth it. More and more former players are publicly acknowledging health problems, including Hall-of-Fame running back Tony Dorsett, who attributes symptoms of CTE such as memory loss and thoughts of suicide to head injuries sustained during his playing days with the Dallas Cowboys in the ‘70s and ‘80s. Undeniably, football at any level is violent. Toughness is rewarded. To “shake off” an injury and get back in the game is seen as admirable. That’s just part of the culture of the sport and true whether it’s the New York Jets or some Pop Warner team in Chapel Hill. Taping an ankle and limping back to the gridiron to the applause of the fans in the stands is one thing; returning to the line of fire once you’ve “shaken the cobwebs” after a blow to the head is an entirely different matter. It’s hard for a parent to draw the line. Maybe youth leagues are safe but reservations start to creep in about the junior high or high school levels as the size, speed and power of its participants naturally increase. Regardless of the dangers, the sport remains a very popular among young people. 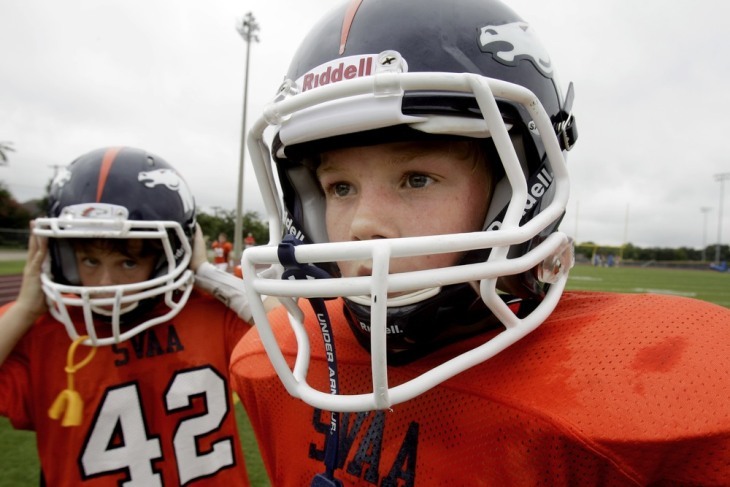 It is estimated that 3.5 million kids play in youth leagues and one million play in high school, although Pop Warner says participation in its leagues has decreased in recent years. Most youngsters who play football don’t sustain serious injuries, although almost everyone who plays long enough will get a little banged up from time to time, a twisted ankle or bruised knee here and there. Head injuries, however, aren’t as easy to detect as a twisted ankle and a bruised brain poses a much greater risk for problems down the road. But How Risky Is It? A group of researchers in North Carolina and Virginia is hoping to shed some light on the subject, according to an article in Technology Review. The researchers worked with two youth teams and one high school team, representing children aged 6-18, during the 2012-2013 football season. With helmets equipped with accelerometers, more than 16,000 head impacts were recorded and measured over the course of that season. Players were given neurological tests and brain scans using magnetic resonance imaging and magnetoencephalography to look for changes in the brain before and after the season. Results are still being analyzed. The researchers hope to develop tools to identify when a player has been hit hard enough, or repeatedly enough, to risk a concussion or other brain injury. The decision can be a tough one for parents. Most of us want our kids involved in extracurricular activities and believe participating on an athletic team builds confidence and discipline. We may wonder whether football is really more dangerous than soccer or skateboarding or surfing or driving a car or other activities in which we allow our child to participate. Many of us have fond memories of Friday nights under the lights and feel like a hypocrite denying the same experience to our children. Still, keeping our children safe is a fundamental task as a parent. Each family must consider the pros and cons and make a decision that’s right for their child. Stephen Raburn... is a writer, blogger, daydreamer, activist, entrepreneur, coffee snob, publisher, child advocate, flaming liberal and father of two amazing little girls who lives in Durham, NC.